Fujitsu Limited and Fujitsu Laboratories Ltd. have today commenced field trials of an ultra high-density distributed antenna(1) , a technology aimed at increasing capacity for fifth generation mobile communications, or 5G. The trials, conducted jointly with NTT DOCOMO, Inc., are being conducted at a testing site established to trial 5G, located at the Fujitsu Shin-Kawasaki Technology Square, a central base for Fujitsu's network business. This trial will utilize a testing system designed for the newly developed ultra high-density distributed antenna technology. In addition to testing that technology, trials will also be conducted on the simultaneous transmission of high resolution video using the distributed antennas. Fujitsu will evaluate application behavior on this testing system, verifying the effectiveness of this 5G technology for a variety of use cases, such as live video transmission in stadiums. Fujitsu and Fujitsu Laboratories will be conducting this trial jointly with DOCOMO, with the goal of commercializing 5G technology from 2020. Mobile communications, whether for virtual or augmented reality, or automation such as for self-driving vehicles, is anticipated to develop even further as a technology that supports an ever-more advanced society built on new applications. With a goal of commercialization from 2020, the new mobile communications system being developed around the world that is 5G aims to support low latency communications and an increased number of devices that will accompany the spread of IoT. It promises to realize data communications speed in excess of 10 Gbps, as well as more than 1,000 times the capacity of the current 4G standards in order to meet demand in line with the explosive growth of mobile communications traffic. Fujitsu and Fujitsu Laboratories are working with DOCOMO on an ongoing basis to conduct field trials of the ultra high-density distributed antenna technology as a means of contributing to increased capacity for mobile communication systems. They have already conducted trials such as an evaluation of communications speed when the distributed antennas are deployed in multiple locations outdoors. Fujitsu and Fujitsu Laboratories have now developed a new testing system for the ultra high-density distributed antenna technology, with the goal of commercializing 5G technology. They are from today working with DOCOMO to test simultaneous high-speed transmission of high resolution video to actual mobile stations. Fujitsu developed this testing system for ultra high-density distributed antenna technology under a consignment from the Ministry of Internal Affairs and Communications for "The research and development project for realization of the fifth-generation mobile communications system." 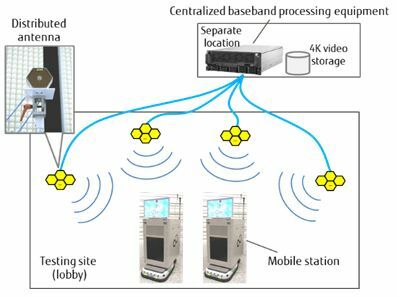 The testing system consists of two mobile stations equipped with displays that can be moved around the interior of Fujitsu Shin-Kawasaki Technology Square, as well as equipment including distributed antennas installed in 16 locations, centralized baseband processing equipment(2) that controls the distributed antennas, and fiber-optic cables connecting the distributed antennas with the centralized baseband processing equipment. Up to 32 distributed antennas can be centrally controlled by the centralized baseband processing equipment, and by using a highly accurate calibration technology(3) between distributed antennas, a proprietary technology from Fujitsu Laboratories, Fujitsu is able to prevent signal interference between the distributed antennas. This configuration makes it possible for the system to test technologies aimed at commercializing 5G technology--notably, the ability for mobile stations using distributed antennas to handle up to 32 streams of high capacity data transmission, simultaneously and at high speed, a world's first. In addition, because this testing system supports IP data transmission, including video, it can be used to test applications for a variety of companies, and under the premise of a variety of situations, such as live video streaming in a stadium. 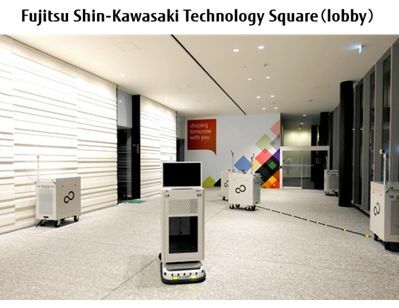 Fujitsu has set up a testing site for the ultra high-density distributed antennas that make use of this testing system in the lobby of Fujitsu Shin-Kawasaki Technology Square, a central base for Fujitsu's network business. The distributed antennas installed in the lobby are connected with the centralized baseband processing equipment in another building with optical fiber, and the multiple distributed antennas are capable of transmitting up to 32 high-capacity data streams, simultaneously and at high speed, to multiple mobile stations. At the beginning of the trial, Fujitsu will test simultaneous high capacity transmissions of different high resolution video to two mobile stations equipped with displays that can be moved around the lobby. Scenes from this experiment from the floor of Shin-Kawasaki Technology Square will be broadcast by relay at the DOCOMO R&D Open House 2017(4) , which will be held at the National Museum of Emerging Science and Innovation (Miraikan) on November 9-10. Fujitsu and Fujitsu Laboratories will continue joint trials with DOCOMO going forward, working to firmly establish 5G technology. In addition, this testing site will serve as an open testing environment for conducting field trials of applications to suit a variety of use cases for 5G-related technologies, including live video transmission in stadiums and real-time information distribution services in commercial facilities and event locations, working toward the commercialization of 5G following 2020. This trial includes a part of results of "The research and development project for realization of the fifth-generation mobile communications system" commissioned by The Ministry of Internal Affairs and Communications. Ultra high-density distributed antenna - A technology from Fujitsu Laboratories that actively controls the shape of cells, which are the range of a signal, in order to improve communication quality for mobile stations through centralized control of base station antennas distributed around a space at high density. - Centralized baseband processing equipment - Digital signal processing equipment that aggregates signals transmitted and received by multiple distributed antennas in a single location. Calibration technology - Technology that improves communication accuracy by correcting for the characteristics of radio frequency circuits in equipment such as amplifiers used in distributed antennas.